You see the ads all the time: “Article writer wanted…” or “Blogger Wanted” or “Ghostwriter Needed.” These often lead to freelance job boards, classifieds and bidding sites that resell your writing to clients. Many are content mills of one sort or another that pay, if you’re lucky, $2 or $3 per 500 word articles when you can collect it. Others, however, are more legitimate and are looking for better quality writing and often for something more than relatively short pieces. They also pay reasonable rates to writers. I’ve never found a certain way to tell from the ads which are which. Those ads with websites are more apt to be higher paying, but that’s not always the case. Most will also publish the name of the company in their ad, but not always. I actually stumbled into a decent ghostwriting broker answering a blind ad. The freelance writing companies that are pay reasonably well are looking for everything from longer articles through white papers to ghostwritten books of 200 or 300 pages. They advertise their services in a wide variety of places and attract an equally wide variety of clients. In the best of circumstances they pay promptly and you’ll be able to get fairly predictable freelance writing assignments from them. Worst case, they will disappear and neither you nor the client will have any real idea what happened. That said, there are some things you should know when you’re considering working for a freelance writing company that’s selling your work to their clients. They’re charging at least double what they’re paying you. Freelance writing companies have to charge at least twice as much as they are paying you, and sometimes more, simply to cover their own cost of doing business and making a profit. If you get $50 an hour from them it means that on your own you can charge at least $100 an hour. This may seem unfair until you really look at what it costs to run a business, then it seems more reasonable. By the way, this is an indication of what you could be charging if you found your own clients. The trick for you, of course, is finding the clients. You’ll sign a contract that precludes you ever working for their client without them. In order to write for the company you’ll have to agree never to go around them and work directly for the client. This can be frustrating, particularly if the company doesn’t do a great job of relaying what the client wants. On the other hand, you don’t have to find or manage the client. You may never get to talk directly with the client. On shorter projects you may never get to even speak to the client or even know who they are. If the company does a good job of finding out what the client wants and communicating that to you, it can work well. On longer projects like books you will be in contact directly with the client. The potential problem is that the company may have given the client unreasonable expectations about how the project will evolve. If the project starts to come apart the company may not be able to help. On short projects you probably won’t even know there’s a problem – just that the nature of the writing you’re doing has changed. Or you may be told a client has been lost, but you’ll never know if it had anything to do with you or not. Probably it didn’t, but it’s frustrating not to be sure. On longer projects where you’re dealing directly with the client, the writing company may not be able to help if the wheels come off. I had this happen once on a book ghostwriting project; the person assigned to help was barely a college graduate and had no idea how a project like ours should evolve. Everyone was frustrated. The contracts tend to favor the company and may not be negotiable. You will be offered some sort of a contract which is good, but mostly it will be drawn in favor of the company. If the company is a large one dealing with lots of writers and clients there’s little if any room for negotiation over price or anything else. You can always ask, and if your skills are excellent and something they need you may be able to get a higher price or a longer deadline, but don’t be surprised if there’s little or no room for change. 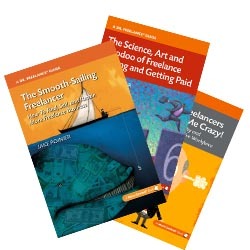 It’s often not difficult to pick up an assignment or two from a freelance writing company. That can be a good test for you. If they pay promptly and things proceed more or less as advertised, great. If, however, the pay is slow or the writing isn’t what was described, move on. You don’t have to put up with an unprofessional company. Writing for freelance writing companies can also give you decent credits and exposure, which always helps when you want to find additional work. Anne Wayman blogs about freelance writing at www.AboutFreelanceWriting.com. She also ghostwrites books and does great press releases for clients. Jake, thanks so much – love showing up on your site. Thanks for the sage advice! Will look forward to returning the favor. If I ever the opportunity to go this route comes along, I’ll be well prepared! Great advice per usual, Anne. It all comes down to taking care of your business and doing what’s best for you and your business. Wonderful advice that I needed to read today. Thankful to have found the link! Anne, I’ve signed an agreement that stated that I couldn’t perform that kind of work if I quit. However, the agreement was so poorly worded that I knew I had a loophole the size of the Pacific. It said we could never tout that we had earned a certain certification if we left, which is nonsense. If you earn it, you earn it no matter where you go. It was a lousy gig, but it provided decent pay at the time. I left when they cut the pay rates in half. great advice! as someone who started freelanceing by writing for these types of companies, I find this to be very, very true.